The drafting chair is a very handy and productive piece of equipment used by many offices, stores and designers all around the world. What’s crucial to their users productivity is the unmatched comfort level. But if your a little on the heavier side, finding comfortable heavy duty drafting chairs or stools can be a very rigorous task. There are some obvious differences between a drafting chair and stool. The stool is the more basic of the two with just the standard foot rest. However when you opt for a drafting chair, your going to be introduced to new level of comfort features and a more ergonomic drafting chair. Which is of high importance when you spend many hours a day working in your office. Comfort and ergonomics are even more important features for us heavy office workers. we need more room and extra padding to really feel at home on any office chair. But a sturdy and extra strong frame is where we really need to pay close attention to. The extra body weight can really take a toll on the frame work of inferior chairs. Which is never a pretty sight. So to make life easier, we have reviewed what we think are the best drafting chairs for heavy people. Plus included arm less stools plus chairs with arms. Note some chairs do have the option of additional add on arms. Not every body likes arms on a drafting stool, not too mention how they can get in the way at times. But that’s what I like about this Flash Furniture stool. The fact it’s armless, however if you do prefer arms this model does come with arms. This chair feels like it was built especially for the big and tall. The seat is definitely wide enough (22″) to hold the recommended weight capacity of 400 Lbs. It’s very roomy to say the least. Multiple adjustable settings are great to get that custom fit feel and the casters seem pretty reliable for day to day use. This drafting chair is well padded compared to many other cheap chairs I typically find in some of the big super stores. The seat and back provides a nice amount of comfort from the 5″ thick padding. Seat height is extendable from 44.5″ to a decent 51″ from the floor. A great tidy chair for finding that right height for standing positions, where one could normally get a sore back and tired legs. The seating is nice and comfortable, but what I really like about this chair is the backing. The mesh backing to be precise. It allows excellent air flow for those hot humid days. Especially handy for shop counters that don’t always get the luxury of Air Con. Some other notable features are the adjustable arms, which adjust in height and also width. The five star casters make rolling around the office so much easier. Which is a good choice for a 300 pound drafting chair. 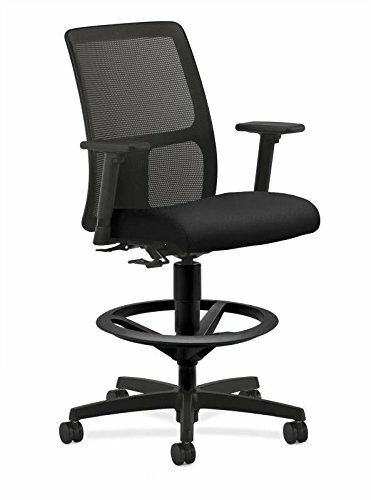 We think Boss have a reputation of making excellent office chairs for heavy people. This 250 LB drafting chair is no different either. A favorite among many consumers. What makes this chair stand out from the rest in our opinion is how darn comfortable it is. It’s perfect for whether you need to be in and out of your seat every 5 minutes, yet ergonomically sound to be used for hours on end. 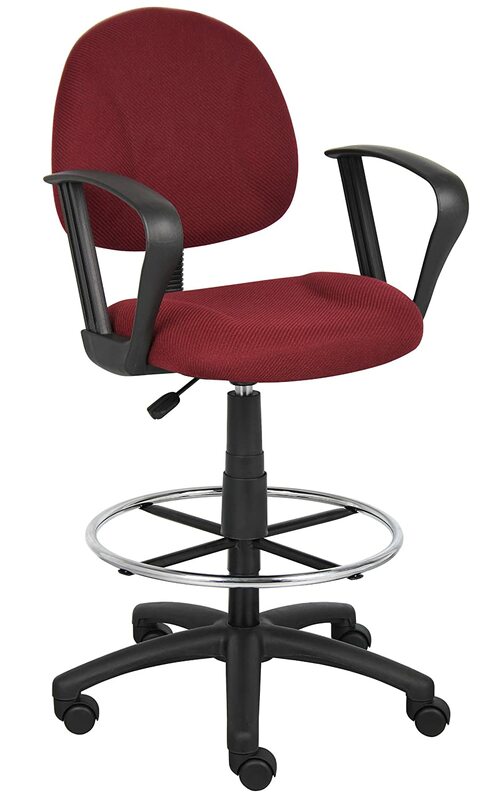 It’s a very affordable heavy duty chair which boasts many top shelf features. 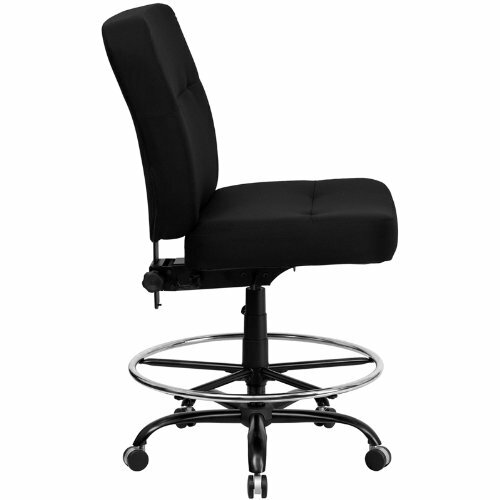 Heavy duty dual casters and high quality fabric make up the value for money chair. 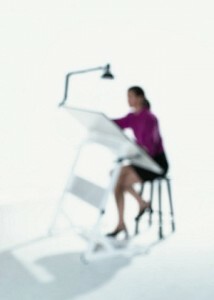 I also like that the Boss drafting stool for overweight people is Available in multiple Colors.